If your pantry is stocked with the right foods you will always have options when it comes to last-minute meal planning and snacks. And that will cut back on last-minute trips to the drive-thru. "You don't have to spend a lot of money to have essential items in your pantry," said Gwen Marzano. Healthy living specialist from Whole Foods Market, Gwen Marzano, says picking versatile, healthy items is the key. "All of these items are $25 and those are going to be the building blocks of the recipes you are going to make. The reason I selected these 10 items because they are minimally or not processed at all so when you incorporate them into your recipes you are going to maximize your health benefits." The first items Gwen recommends to always have on hand, lentils and beans. "Black beans you can buy dry or cooked. A great way to incorporate beans is just to use the canned, no salt added, 365 brand. The great thing about beans is they are high in fiber, no salt added. You can add them to any type of taco dish, chili, soup or even a stir fry is going to add that benefit. They also maintain their velvety texture and shape in any recipes. Garbanzo beans are a wonderful source of protein or fiber, so adding them on to a salad will help you keep full longer. You can also the beans to make hummus, which then you can use as a spread on wraps and sandwiches. Lentils are a legume and they are also very high in protein and fiber and also great source of foliate and magnesium. You can precook them and have them in your freezer and add them to your salads, chili, soup," said Gwen. Gwen says another must have is quinoa and diced tomatoes. "Quinoa is a grain that a lot of people don't use because they are unfamiliar with it. It's actually a wonderful grain that is complete with protein so it contains all your essential amino acids. It cooks very easily like rice. You can use it for breakfast lunch or dinner; you can use it with beans and rice, or add whatever vegetable you have in your pantry to create a healthy meal. Canned tomatoes are a great pantry essential because they are good in so many different dishes. You can add them into a black bean soup, or any quinoa cooked dish." We all know tuna can be used on sandwiches, but Gwen suggests mixing it up. "Canned tuna is typically used in making tuna fish for sandwiches but you can also use it in any cold pasta dish or casseroles. If you want more protein, add it to the top of your salad. It's a great source of protein and contains essential fatty acids. We all know that making broth takes time. Having premade vegetable broth in your pantry is a great idea. It's not only used for soup but it can also be used for stir fry. 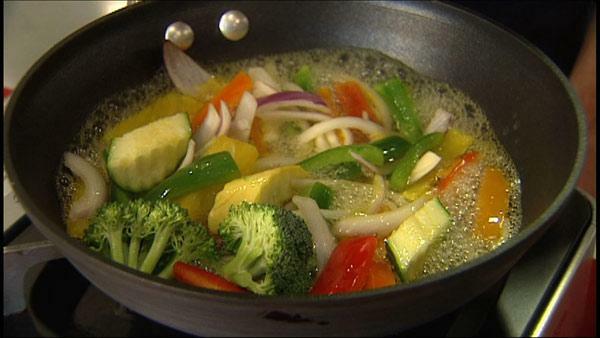 What I really like to do is throw in a couple of tablespoons to a hot skillet there you have an oil free stir fry." Gwen says applesauce can be mixed with cinnamon for extra flavor but it's also great for recipes. "So next time you are thinking about making brownies, cakes or muffins simply substitute the oil for applesauce and you have just made your recipe a lot healthier." Unlike regular milk, almond milk doesn't have to be kept cold before opening. "Just use it in substation for regular milk in your cereal, you can use it in your smoothies and also your oatmeal, as a delicious idea for breakfast." And, here's something you probably already have in your pantry oats. "Quick oats are great for breakfast. They cook very fast, within five minutes. But they are not just for breakfast. Next time you are making cookies, breads or cakes, throw in a couple extra table spoons or even a fourth cup of rolled oats, for additional health benefits. Oats are also a great source of fiber which help keep you fuller longer."